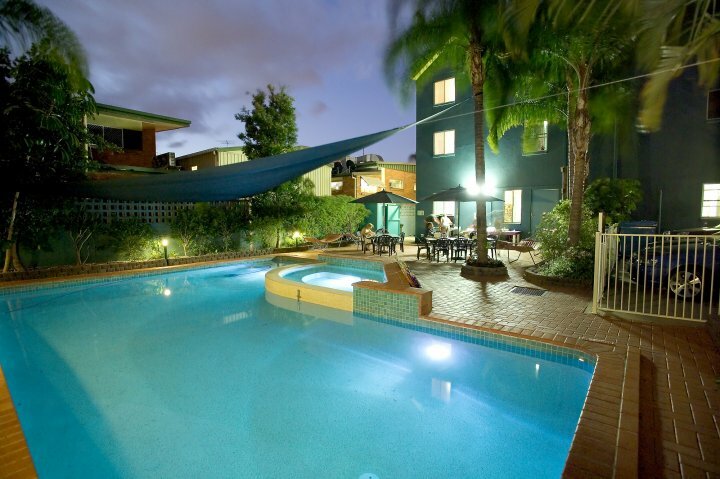 Aquarius Backpackers Hostel is located in Southport - Surfers Paradise on the Gold Coast in sunny Queensland, Australia. All year round, there is all the excitement you would expect from one of the worlds greatest tourist capitals. Our team is dedicated to help you have a great time whilst you reside with us. Our local area knowledge, our advice, our personal approach to your individual needs is what we are about. Aquarius is so much more than a check yourself in put your head on the pillow operation we care about you. We want you to have the best time and experience that you can have whilst you stay with us. Let us show you a little of what you can expect when you stay with The Aquarius Backpackers Team. 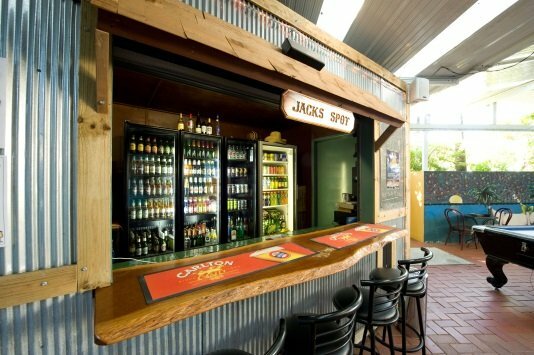 You will find clean, modern, safe and friendly accommodation that has a great bar, activities like pool, darts and party games. 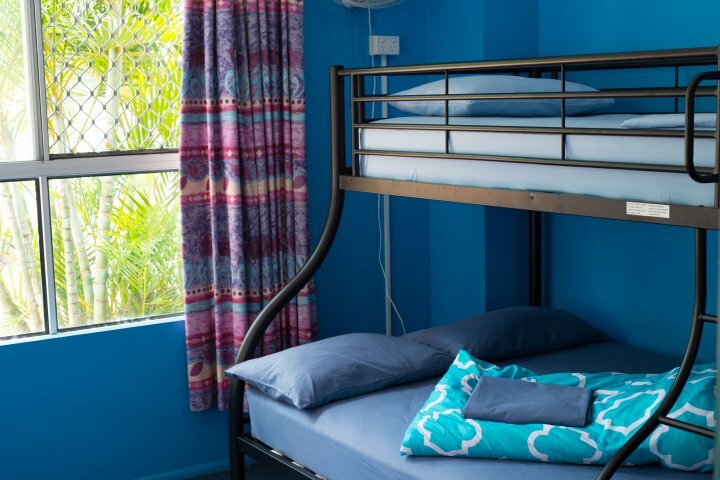 Our Hostel is close to all your needs shopping centres, banks, post offices, pubs, and above all, our world-famous beaches and lush green Tropical Hinterland. Aquarius is the place to relax, party, have fun and make friends. Our friendly staff are here to look after you by offering the most exclusive homely stay with that extra personal touch. 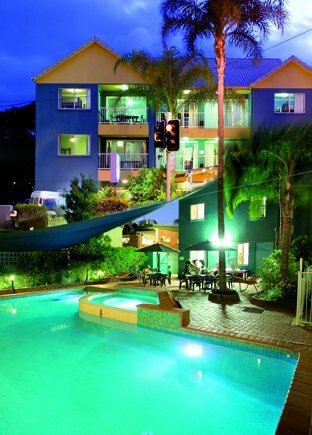 You will not find this touch anywhere else but at Aquarius Backpackers Gold Coast. 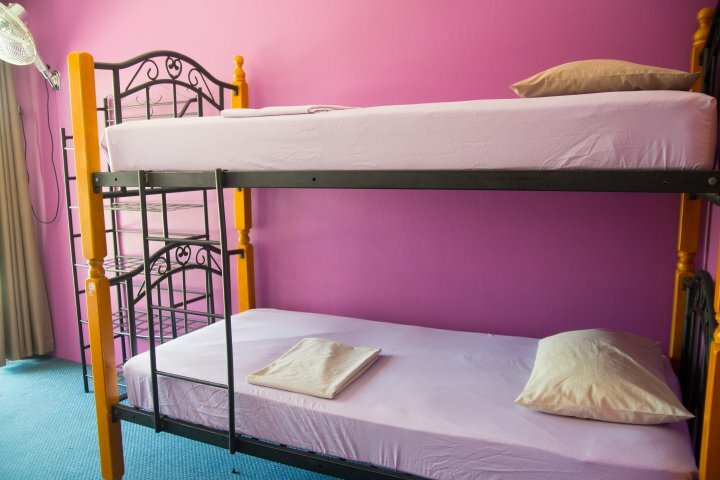 Female dormitories are available in our hostel because we want to provide the most comfort and intimacy as possible to each of our guest, even in a dormitory. This type of room contains 2 bunk beds. The fresh linen and the blankets will keep you warm at night and the fan fresh in the day. You can put your belongings in the shelves and if you have any valuables, just give them to the reception which will put them in the guest safe for you. 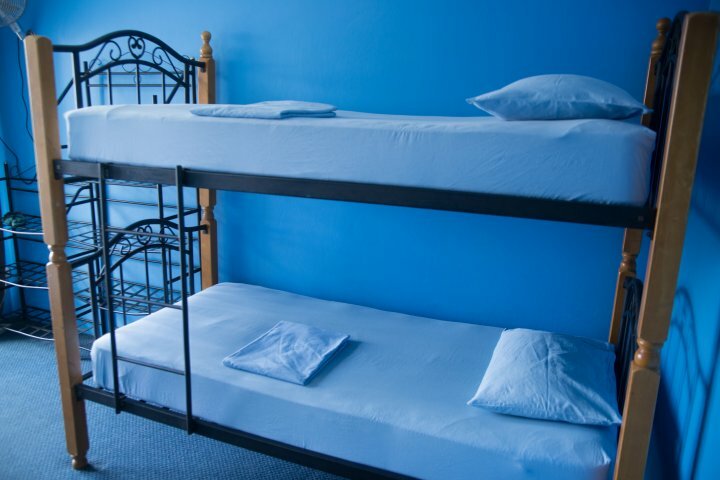 Male dormitories are available in our hostel because we want to provide the most comfort and intimacy as possible to each of our guest, even in a dormitory. This type of room contains 2 bunk beds. The fresh linen and the blankets will keep you warm at night and the fan fresh in the day. You can put your belongings in the shelves and if you have any valuables, just give them to the reception which will put them in the guest safe for you. 4 Bed Mixed Dormitories are a good way to find an accommodation for amazing price with a maximum of comfort and a perfect way to meet people. This type of room contains 2 bunk beds. The fresh linen and the blankets will keep you warm at night and the fan fresh in the day. You can put your belongings in the shelves and if you have any valuables, just give them to the reception which will put them in the guest safe for you. 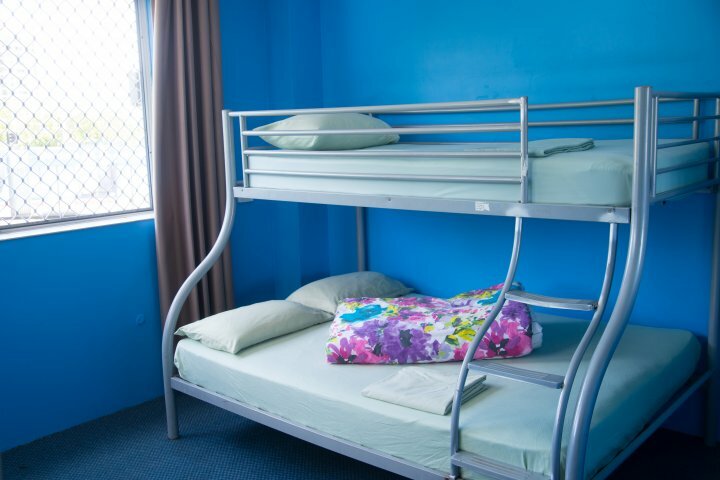 6 Bed Mixed Dormitories are a good way to find an accommodation for amazing price with comfort and a perfect way to meet people. 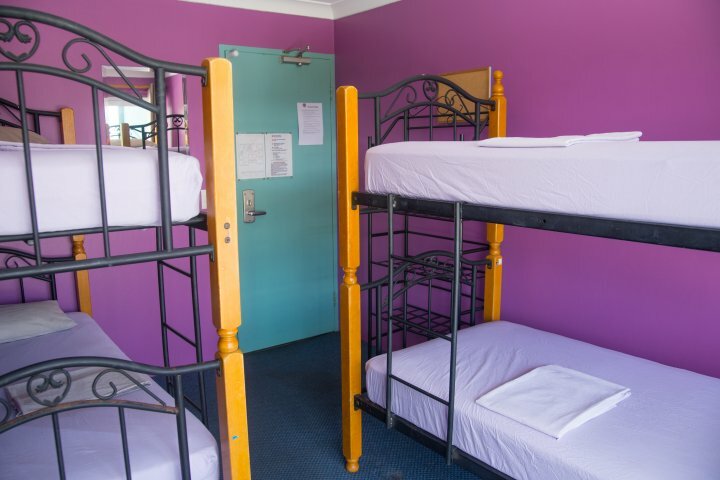 This type of room contains 3 bunk beds. The fresh linen and the blankets will keep you warm at night and the fan fresh in the day. You can put your belongings in the shelves and if you have any valuables, just give them to the reception which will put them in the guest safe for you. A very cozy "Private Room" is waiting for you. This room is all yours, with a Queen size bed and a extra single bed available, this is the best compromise between privacy and a reasonable price. The doona, the fresh linen and the blankets will keep you warm at night and the fan fresh in the day. You can put your belongings in the cupboard and shelves, and if you have any valuables, just give them to the reception which will put them in the guest safe for you. Rate applies for the extra guest in the private room. Please bring identification to check in, in the form of a passport or driving licence, as well as the credit card that you made the booking with and $20 in cash per person for a key deposit. Our reception hours are 700am to 1000pm Daily. Check in times are from 10am to 10pm and your room will be ready by 2pm. If your arrival time is outside of these hours please call or email to make alternative arrangements with the reception staff. We have bus schedule that picks up from the Surfers Paradise or Southport Transit Center at 900am or 600pm daily. 1 bus per time slot and only upon request. For this service please email or phone the reception staff to confirm you wish to use this service. Otherwise, you can catch the tram to the Southport South stop which is located across the road from the hostel and the trams runs every 7 -15 minutes during the day. We can also organise you a transfer from the Gold Coast Airport and Brisbane airport at a cost from $30 to $49 per person one way. For this service we require your flight details and destination of arrival. No persons allowed in the hostel under 18. The addition of a 3rd guest to the private room will incur a fee of $35-45 depending on the rates of the season. Free Limited Parking available around the back of the hostel. If full, side streets are free to park overnight. Tram $4 to $6, 24 hours on Friday and Saturday nights, until 12am the rest of the week. We are across the road from the Southport South tram stop. Bus Free Shuttle from the Surfers Paradise and Southport Transit Centre Daily 9am to 6pm. Train Brisbane Central to Helensvale Train Station, then bus to Australia Fair and walk 4 minutes south. Plane Brisbane Airport- to Helensvale Train Station, then bus to Australia Fair and walk 4 minutes south. Coolangatta or Gold Coast Airport- Catch the 777 bus from the Airport to Broadbeach and then catch the tram from Broadbach to Southport South tram stop. We are located across the road from the tram stop. Or call Aquarius and we can organize an airport transfer from $30 to $50 per person. We just need your flight details. As one of the world's biggest tourist destinations, the Gold Coast has a massive list of attractions and activities for you to enjoy during your stay. If there is something you really want to do, and you can't find it on our list, then contact our friendly staff and they can arrange it for you. If it's exciting, it can be found on the Gold Coast! 1. Soak up the beautiful Gold Coast sun in our private outdoor tropical pool while listening to some funky tunes - why not grab your FREE tropical slushie from the bar! 2. Take a walk down to The Spit and venture out onto the rock wall and take some amazing pictures of the Gold Coast's skyline. Make sure you check out the sand dune walk on your way and keep an eye out for Humpback Whales from July through to November. 3. Explore the large shopping centre Australia Fair, only 5 minutes walk from us. 4. Take a walk along the 57km stretch of beautiful beach and check out some of the world's best surfers. Please remember to stay safe & ALWAYS swim between the red & yellow flags. 6. On a rainy day, chill out in our super comfy lounge room and choose from over 400+ DVDs. 7. Grab a crew and play a board game, cards or have a pool party. 8. Show us how smart you are FREE Quiz every Friday Night at Jack's Spot Aquarius. 9. If art is your thing then make sure visit to the Gold Coast Arts Centre. 10. Get up early or go to bed late! - Experience the breathtaking Gold Coast sunrise from the beach. Please remember to stay safe & ALWAYS swim between the red & yellow flags.